Have you ever had to ask yourself, how God chooses mothers of disabled children? Why her? She is so happy – just because – says God smiling. God created man in his own image. However, in Milosz’s picture He revived another life… perhaps far from perfect. Our history is short, perhaps because Milosz is only 10 months. He was born prematurely at 32 weeks – November 9, 2014. We had a short time to prepare for a different value of life, our second child. At 24 weeks we were told “the child has a tumor on the heart”, please contact the Children’s Health Center… we had many questions, and were given even more answers. Tuberous sclerosis complex (TSC) is a spontaneous genetic disroder that causes non-malignant tumors to form on different organs. In your sons’s case they formed on his brain, heart, kidney, eye. I’m sorry… said the doctor. Following double RMI – resonance we were told that Milosz has cortical dysplasia. These damaged cells under the tumor cause the epilepsy. A surgery is possible, because tumors are found within the frontotemporal panel. After removal of Tumor and Dysplasia, our son could have a good chance for a normal life without devastating seisure attacks. Hence the importance of immediate action. 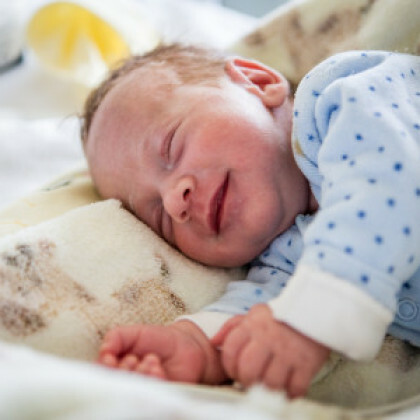 Unfortunately, due to prematurity Milosz may not be currently operated in Poland, but we can operate in the Clinic in Germany. The cost of the operation is $200,000. The operation is not possible in Poland because Miłosze is too small, the country’s only solution today is the supply of the following antiepileptic drugs that do not work in such a large quantity and attacks persist. This situation means that the child does not develop and the brain damage only deepens. For any parent looking at a child who has more than 50 attacks a day is traumatic experience and leves you helples, because the medication does not help. You can not ask a child to fight it – attacks are so strong that after a couple in series a child is so weak that he falls asleep. It’s probably the only moment in which an adult cries and asks for the lightest course of the disease and strength for the next day. He deceives himself and the children hiding the grief, a parent’s pain, consciously, to give the child a glimps of childhood. As a mother, I ask that each of our day is not spent on crying and lack of strength for Milosz and for us. Knowing that we can fight this disorder by performing a neurosurgery, and knowing that the time is agianst us, we want to do anything to save her son. We are trying to turn despair into action and ask for help. Milosz is such a small, cheerful sunshine, and every day being with him for us is this ray of sunshine, a ray of hope for a better tomorrow – tomorrow that includes him. As a mother, I thank God for each day, even with an attack of epilepsy. Looking at Milosz I’m happy from his small, yet hard earned success – that he is. For us parents every day is a lesson of humility, faith and requests that the disease does not progress. Each of his stages of life is marked with worries; we knew that it would not be easy, but none of us wanted to believe it. There comes a moment in life when you know that nothing will be as before. I know there is no turning back, that time can not be undone. We would like for a moment to change the course of the river, the river of our Milosz so that he was a healthy child. But without the help you just can not. You can help Milosz by making a donation.